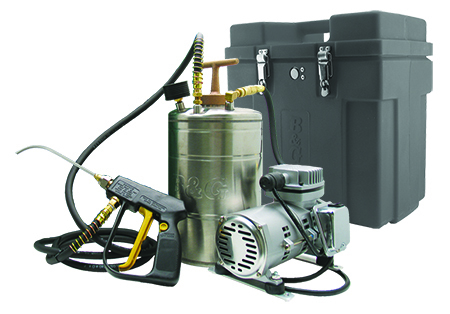 This complete foam delivery system is built around a small and quiet compressor, a 1 gallon stainless steel tank with a pressure gauge, a 7 ft. hose, a rugged valve with a curved application tip. The entire system fits into a B&G Carry Case for no spills and portability. The self-regulating compressor maintains operating pressure in the tank, and ensures consistent foam throughout the application—no adjustments are necessary. A variety of tips are available the units are supplied in either 110V and 220V. The VersaFoamer 4000 can be used in a wide variety of application from Termite or Carpenter Ant Treatments to Commercial Kitchen applications. An added feature of the Versafoamer 4000 is that it can be removed from the electrical source for spot treatments. With the tank fully pressurized you can achieve up to 40 seconds of foam application. View or download our new B&G Foam Application Manual.